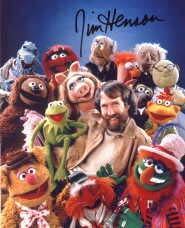 As a young man, Jim Henson had a great desire to work in TV and film and there is nothing so unusual about that. It is, after all, a part of the American dream. He wasn’t so much interested in the role of an actor or presenter. It was the other side of the camera that he was interested in. He wanted to work unseen – as a scriptwriter or maybe a director. Success came early. When he was still at high school a local TV station announced it was looking for young puppeteers. He created a hand puppet out of his mother’s old green coat and made his first performance on The Junior Morning Show. After that he appeared in many other TV shows. In 1969 Children’s Television Workshop asked him to produce the puppet segment of the show Sesame Street. That was the time he made his first real puppet creation. In 1976 Henson visited London where Lord Grade, an important person in the British entertainment industry, offered him to produce a TV series of the Muppets. Henson accepted and The Muppet Show was born. The show soon became very popular on the both sides of the Atlantic. Singers, actors and celebrities from all areas of show business appeared in the show. Sylvester Stallone, Roger Moore, Alice Cooper and Liza Minelli are just a few of them. The success of The Muppet Show led Henson to his first film, The Muppet Movie, and many others after that. Books and T-shirts, Muppet records and tapes became popular all over the world. It was clear – Jim Hanson created an empire. Still, he felt something unfulfilled. Kermit was, after all, just a sort of sock with a mouth. Hanson wanted to make his puppets more sophisticated. He bought an old post office and turned it into “The Creature Shop” where he gathered a team of artists and designers. Together with them he made a new fantasy puppet film, Dark Crystal with great special effects. It was Universal Pictures’ most successful film of the year. “The Creature Shop” began making puppets not only for Hanson’s use, but also for the film makers all over the world. His puppets appeared in the film Labyrinth with only two human actors (one of them David Bowie). There’s no doubt – Hanson’s puppets became more serious than anyone would ever expect.